This is my favourite baked cheesecake adapted from Alex Goh cookbook. I have baked many times and the outcome is great! If you are using spring foam it is advisable to line the base with baking paper. It will ease the process of transfer cheesecake to cake board. You may omit the marble and keep plain. It tastes good on its own too. 2. Add (B) and cream till smooth. 3. Add (C) and cream till well blended. 4. Add (D) and (E), mix till well combined. Set aside. 5. In another bowl whisk the egg whites till frothy. Add vinegar and half of the sugar. Continue beat till incorporate. Add in the 2ndportion of sugar and continue beat till soft peak. 6. Mix the egg white batter with the cheese mixture in 2-3 batches. 7. In a separate bowl mix pandan extract with 200g of the cheese mixture till smooth. 8. Line the base of spring foam with baking paper. Pour about 1/3 of the plain cheese filling into the mould. 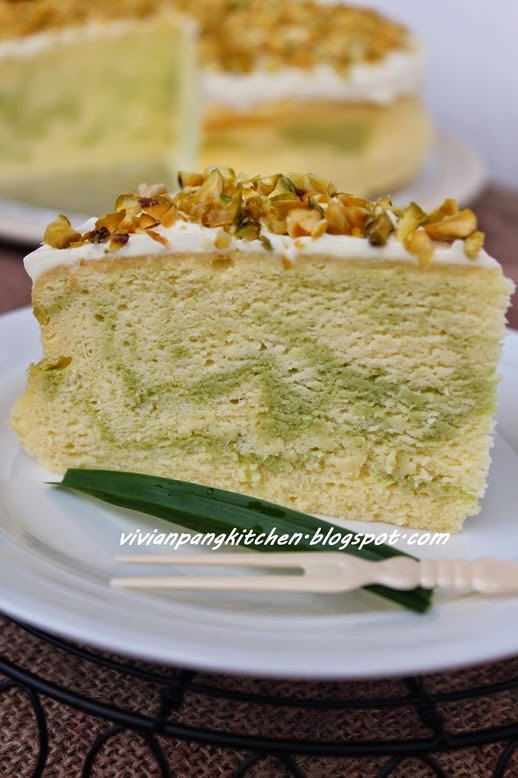 Place some of pandan cheese filling on top and finish by topping both layers with the remaining plain cheese filling. 9. Bake in water bath at 120C for 90 minutes or till set and golden brown. *I’m using steam bake by placing a tray of hot water at the base of oven. Adjust your oven temperature accordingly. This looks delicious, i would love to try this out. Thanks for sharing! This intrigues me with the marbeling. I can see why this is your favorite. Vivian, this cake is so delicious! Must try! 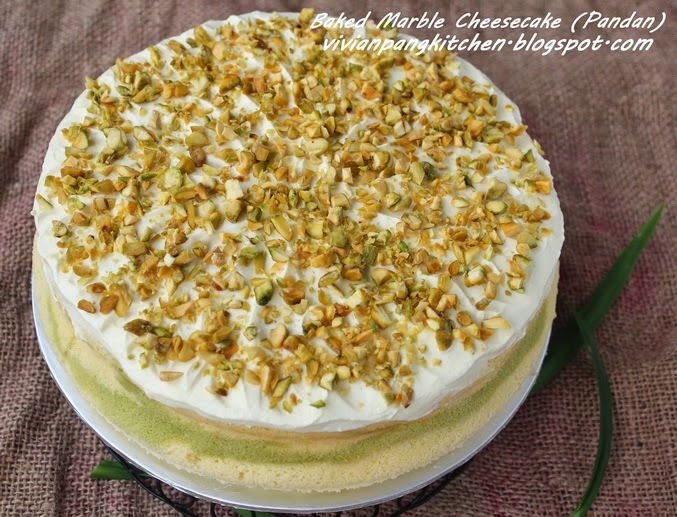 Lovely marble cheesecake, make me tempted to try it out :) Thanks for sharing with us. Hi Vivian, i would like to know how big your Springform for this cake?? thanks and will try this week. This is such a beautiful cheesecake. 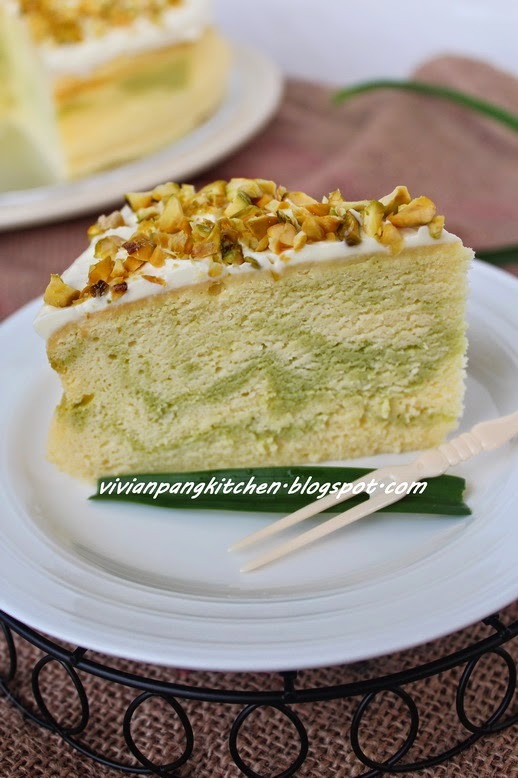 Love the pandan marbling! Like!